With the weekend’s lovely weather, we finally pulled out G’s new bike. Our original plan was to try the initial [non-training wheel] ride on grass, so there would be a soft surface to cushion falls, but the thawing ground was too mucky for that. After a bit of brainstorming, we realized a rubber playground surface would be a good option (better than our original idea, really, due to less resistance and a more even surface). When G woke from his nap on Saturday, we asked if he wanted to go to the park. Matthew aired up the bicycle tires and propped the bike up in the yard (no kickstand), then stood by with the camera, ready for the big moment. I led G to the backyard (Peter Pan sword in hand). The sun was really bright, and for a few moments, G didn’t see the bike at all. When he saw it, it took a few moments to sink in . . . .
We helped him climb on (which worked better after suggesting that he first put down the sword), then back off, so we could adjust the seat height. He wanted to get back on, so we went to the park like this. 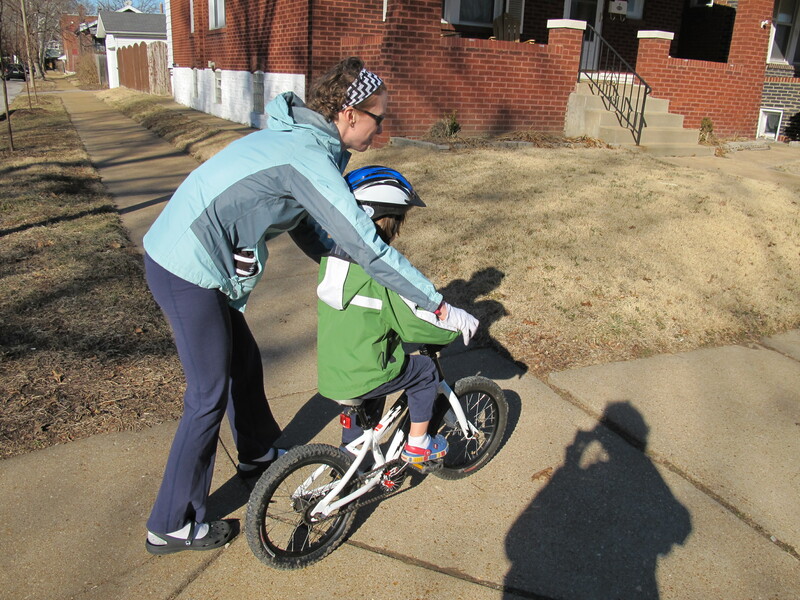 With no prompting, he was singing, “Biker boy, biker boy,” as he pedaled. He took a few spins around the playground (with one of us assisting, as above) before deciding to ditch the bike in favor of playing Peter Pan and Captain Hook. On Sunday, I let him tip over into the grass a few times, and we laughed it off. 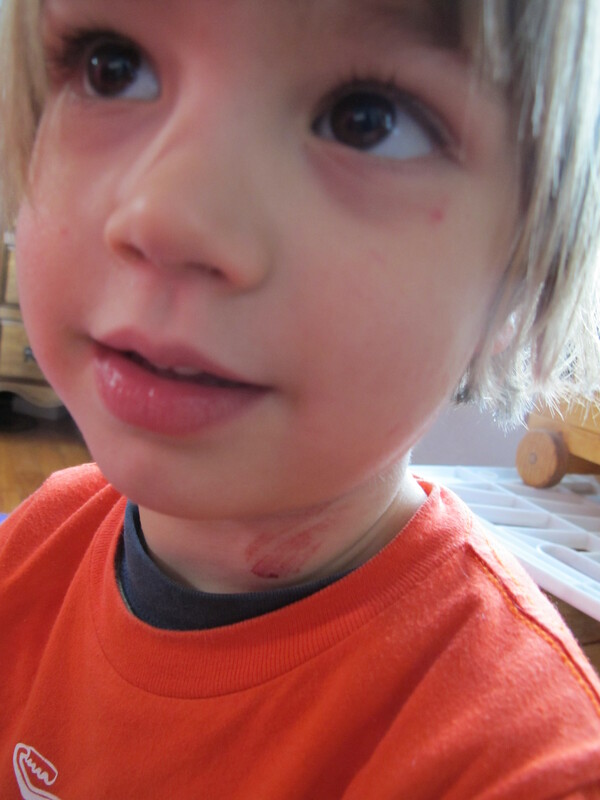 We did have some tears from a non-moving fall (a dismount issue), that led to a handlebar jab to the neck — ouch! We’re torn, knowing that we could put on the training wheels and let him zip around independently right now, instead of this rather parent-intensive model. On the other hand, once the training wheels go on, convincing him to lose them could be a little tricky. I think we’ll give the non-training wheel, parent-assist model a little bit more time. On the way home on Saturday, G commented, “This bike isn’t very colorful.” I agreed, and asked him what color handlebar grips he would like (the original grips need to be replaced anyway — I almost bought a new set before we gave him the bike but was overwhelmed by the color choices). He decisively responded, “Red,” and then said that he would like some “decorations” for the bike. Adding some fun decals had already crossed my mind. I’m a bit hesitant, wondering if that would make it look junky, or less appealing to a future rider, but realistically, this bike is starting out well-loved, so I’m not really expecting to get much for resale. It’s probably worth making it more fun for him now. I like the Outer Space kid’s decals at RydeSafe (or maybe just their Modular Kit), though I wish there were a bright green color option (though I guess G might prefer red anyway), and I like a few of the decals here. Anyone know of other sources for fun, colorful bicycle decals? This entry was posted in Biking and tagged kids bikes. Bookmark the permalink. If you’re at all crafty, you can buy your own tape and cut out your own decals. Amazon has tons of varieties and colors. Your local hardware store probably at least has red and yellow. Not super crafty, but enough for that. Thanks for the idea! Pingback: eGreenLife | Bicycles, egg hunts, and garden time!